CRCA will be holding an uphill time trial from the Alpine Boat Basin up to the Ranger’s Station on May 16. Proceeds from the event will benefit the Alzheimer’s Association. 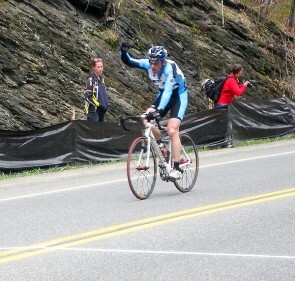 Colin blows away all comers in the kilo at Kissena. CRCA took 6 wins at Battenkill. Full Battenkill results and race reports. The indestructible Ann Marie Miller won the women’s Quabbin Road Race. On the track, Colin Prensky blew everyone away in the kilo. Evie Stevens won GC at Ephrata and Gavin Robertson of Foundation won the overall Spring Series title.